12 girls and boys (2 participants per country max.). Acceptances will be granted on a “first come first served” basis subject to country and age requirements as above. Participants must have a good knowledge of English. German and other languages welcome. But camp language will be English! 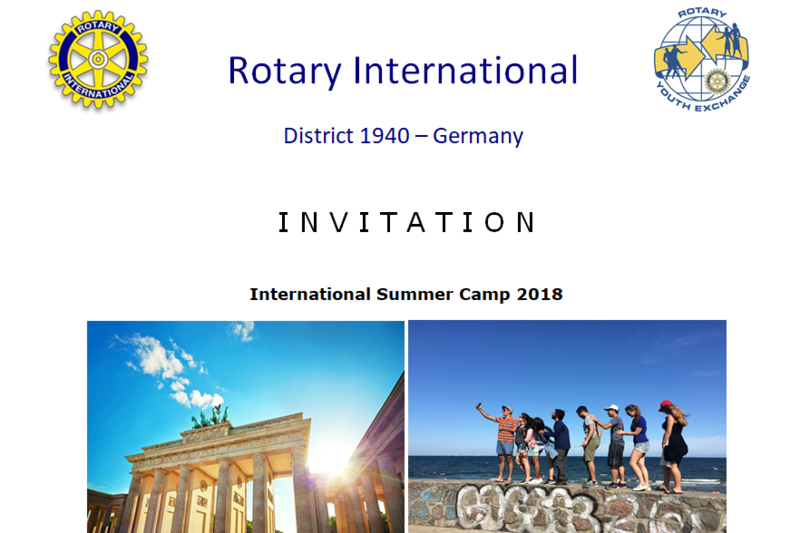 During the camp the hosting Rotary Clubs will organize a varied and diverse programme, e.g. cultural, sports, sightseeing a.o. Be prepared to represent yourself and your country. Accommodation will be in a youth hostel in Berlin near Alexanderplatz. 3 days will be spent at the Baltic Sea. Casual and formal. You need sports clothes, swimsuits and walking shoes. Participants will have to pay a registration fee of 150 € after acceptance and travel costs to and from Berlin. They should also bring adequate pocket money. All other costs will be covered by the hosts. The YEO´s of the participating country are asked to send their applications on international standard forms before 30th May 2018. Apply through your local Rotary Club / Rotary District. All participants will receive acceptance information as soon as possible, and final details about the camp will arrive no later than 31st July 2018.